Poker is a game of chance and skill. The ability to play and outplay your opponent requires more than simply a lucky hand, it requires an intimate knowledge of them game itself in order to claim victory. The game is easy to learn but difficult to master, so any chance that one has to succeed should be taken. With the Texas Poker app, people have the ability now to practice playing poker. No real life stakes, but real life circumstances. Replication of this environment is crucial to a game that is fun to play. Without this sense of realism, the game can become bland. The live replication once again makes it feel real and adds an energy that can’t be replicated from simply playing cards. It replicates a Las Vegas card table allowing you to feel like you are really at the table. Multiple players are allowed to compete, so you are not simply playing a computer. One of the best features is the ability to connect with your friends and play them from wherever you are. You can invite them to a game at a friend’s table. The friends table serves as a sort of group that allows you and your friends all to play a hand at the same time and complete the game with one winner. 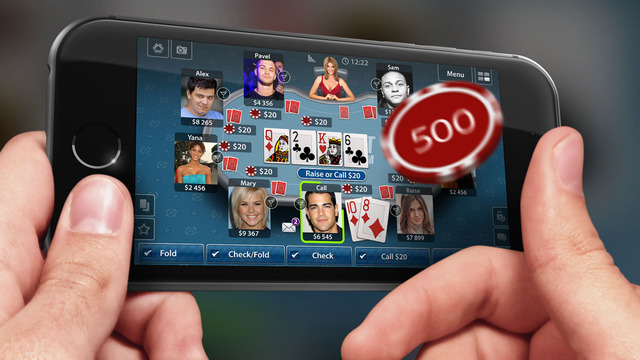 This unique feature offers a real-time experience, where the players can determine to bluff or call. It can be better than real poker at times, and even more difficult. This creates a sort of rush. Playing your friends makes you feel like you are really playing a game of poker but you have the luxury of playing in the car, on the way to work, or even lying in bed. Most poker games are either against strangers or against some kind of computer. Human interaction is what the game is all about. Playing online also comes with rewards. Some of these rewards can be in-app purchases and bragging rights, but some can even be monetary. Better still is the game’s ability to generate rewards. Every single time you log in, you are entered in a daily lottery that puts in the running for rewards. Poker is, after all, all about the payouts and rewards one can receive at the end of the game. The game comes with 50,000 free chips but through wins and various lottery prizes you are capable of winning more and competing at higher stakes games as well as earning different rewards. For those of you who fancy yourself a Casino Royale James Bond type, this game is definitely for you. Poker can only be truly enjoyed when played against other people and this is the only game that can truly replicate that experience to its fullest potential. Other games lack the tension and thrill that comes with live playing.